Nikonians who enjoy pushing the boundaries of creativity with their Lensbaby lenses now have a wider dimension to play with. 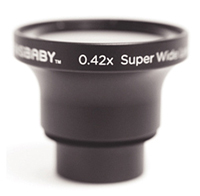 The new 0.42x Super Wide screws onto the 37mm threads on the front of your Lensbaby lens, resulting in a conversion of the lens from 50mm to 21mm. The 0.42x also has a macro capability, allowing you to focus as close as 2.75" (7 cm) away from the front of your lens. Nikonians podcaster Martin Joergensen recently reviewed the Lensbaby in his blog and The Nikonians On Location #45 episode entitled - Yeah Baby! Don't forget to check his Episode #45 Video Supplement.